Reliance Jio have been launched their popular ”MyJio” application and there are various types of smart application like that JioSwitch, JioNewsPaper, JioCloud, JioTV, JioMusic and JioCinema. There are also have a similar smart application JioMoney that gives user all the benefits of cash without any limitations. The application enables to user to make secure digital payments from anywhere to anyone.The application has some simple navigate features that is easy for everyone to use. Recharge any Jio number in just a few simple clicks and user can get the best offers on your Jio payments. User can also recharge any connection prepaid or post-paid phone, DTH or data card. 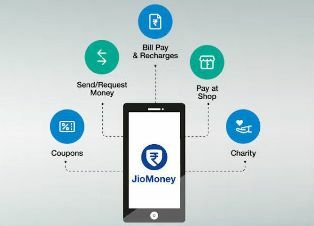 JioMoney helps user to make simple secure bill payments like Monthly gas, electricity, mobile and landline. JioMoney make payments too faster. Pay your insurance premiums digitally. Book train tickets or Uber cabs, buy tickets at Bookmyshow and Imagica, shop at Groupon and Starbucks, plus thousands of other retailers. Send to and receive money from family and friends. Get great deals, coupons and cashback directly on your mobile phone from local merchants. 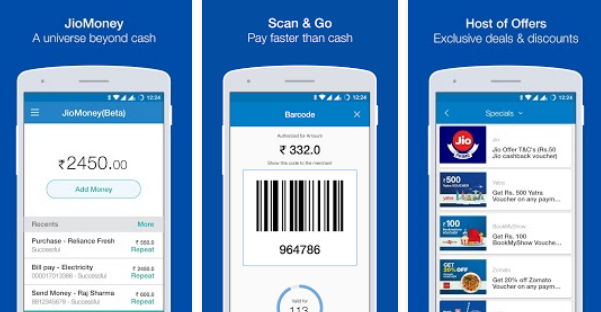 JioMoney also enables to digitize Reliance One loyalty points and earn extra points from within the app periodically. So, users can Download JioMoney application and use to secure way to make all digital payments.